The DeSantis 001 Thumb Break Scabbard Holster is a high-riding design that allows for versatile draw angles depending on which of its multiple belt slots are employed. The raised height makes the holster more comfortable to wear while seated, perfect for officers who spend long periods of time in a vehicle. The sturdy leather comes in plain and basketweave finishes, with or without a protective suede lining. Each Scabbard is structured to fit a specific handgun model for optimal levels of retention. A built-in thumb break improves security even further, and most models include an adjustable tension device for a custom fit. The holster attaches belts up to 1.75-inches wide. Note: Basketweave holsters are made to order. Please allow up to 4-weeks for delivery. Thumbbreak strap cut way too short. Bad fit. Had to stretch it much more than my other leather holsters. Bad quality control. Leather is thinner than my Galco holster. Just a little bit to big for my smith and Wesson 5946. Nicer and better that I could have expected holds my Glock17 nice and tight. Put it on and away I go. Great holster, ease of use. Love this holster. Perfect fit for my SR45. Fast delivery. Fit my gun perfectly without any break in needed. As advertised. Perfect for my use. Great job CopsPlus. Will this holster fit the HK p30ls? This pistol is 12" longer than a standard p30. will the barrel and slide pretrude the bottom of the holster? Barrel will protrude out due to the extended length. 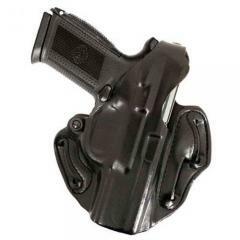 Is this a 3 slot holster? Yes, it features 3 belt slots for strong or cross draw carry. Is this an exact match for the S&W 5946? Yes, this will fit the Smith and Wesson 5946. Will this fit the Taurus PT 247 G2? Will this holster fit my XDM .40 with a 3.8" barrel not compact. Yes, select "Springfield XDM (3.8" bbl)".